Tin đăng trong 'Cờ tướng, cờ vua, cờ vây...' bởi admin, Cập nhật cuối: 15/04/2019. 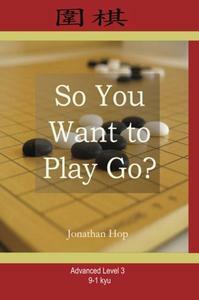 Jonathan L Hop, "So You Want to Play Go? Level 3"
This book is designed for digit kyu players to assist in their never ending quest to become 1 dan. This edition is far more rigorous than the previous two and will delve deeper into topics like the Opening and the Middle game to help you raise your level of play, as well as go over finer tactical concepts like overconcentration and probes so you can easily apply them in your games.